HipHopopotamus is a colorful and funky online video slot game from Microgaming that has been released in August 2008. This online video slot machine game has 3 reels and 1 pay line. The theme of HipHopopotamus is all about a hippopotamus that loves to dance to the beat of hip hop music. Considered to be one of the most specially-made slots games which resemble a pub slot more than a video slot game, HipHopopotamus is a very entertaining slot game to play at, most especially when they have included Nudge, Shifta and Hold features, which sets this one apart from other 3-reel classic slots. Most Microgaming online slot games are available in 2 formats. The first format is the one preferred by most players, which is the download format. The second format is the Flash or browser-based version, which means there is no need to download anything at all. Whether you like to download or not, Microgaming has slot games for all your slot gaming needs. HipHopopotamus is available for instant play only, so you no longer have to download anything. Give HipHopopotamus a spin and you will surely see classic online slots in a whole new perspective as this one is not only entertaining, but it is also generous as it gives you many ways to win! Nod your head over and over again as you play this cool hip hop-themed online slot game! In this slot game, you’d definitely love seeing the Hiphopopotamus turn up on the reels as three of them can reward you with up to 500x your bet! You will definitely love to stay and play a while in the cool and amazing features of HipHopopotamus online slot game such as the Hold Feature, Nudge Feature, Shifta Feature, Extra Interest Feature, Reel Bonus Feature, Scratches Feature, Bonus Squares, and different Hi-Lo Bonus Feature games (Busta Hippo, Funk You Up, Rapper’s Delight, Beats, Rhymes and Cash, Like a Jungle, Rap it Up, Grand Master Cash), and the maximum cash jackpot you can win is $5,000! The quality of the graphics and sound provided by Microgaming software is without doubt outstanding. They possess an impeccable track record of making the most impressive graphics and realistic sound effects. A lot of online slot players love Microgaming because its online slot games have smooth animation and remarkable yet non-intrusive background music and sound effects. The slot game looks a lot like a typical pub slot game than a video slot game, but most players don’t mind much whatever it is, because for them it truly is a very exciting slot game for something that has only 3 reels and 1 pay line! The background of the reels shows a brick wall filled with graffiti and a DJ’s hand on a DJ mixer located near the Nudges indicator. The payout is shown on the right side and below the reels; and the HipHopopotamus is showing his bling on the game logo at the lower left side. The game screen is bursting with colors the street, mainly purple, blue and gold. HipHopopotamus has been designed to have an authentic casino ambience with matching sound effects, which makes you more convinced that you are in a real casino playing an old-school slots game. HipHopopotamus does not have a constant background music. When you spin the reels and get nudges or winning combinations, you will hear funky hip hop music with the hippo saying words such as “Representing”, “Shizzle my Nizzle”, “Gangsta!” and many more. There are no regular card deck symbols available in the HipHopopotamus online video slot game. The regular symbols that you will find in the HipHopopotamus slot game are the Hippo, Bling Necklace, Microphone, Ghetto Blaster, Trainer, Aerosol Paint Can, Seven, Bar and Cherries. There is no Scatter Symbol in the HipHopopotamus online slot game. What sets HipHopopotamus apart from other 3-reel, 1-pay line slot machine games is that it has great features and bonus feature games! It has many cool features (Hold, Nudge, Nudge Bank Held, Extra Interest, and Shifta). It also has a fun Hi-Lo Bonus game that offers Bonus Feature games, Bonus Squares, and the Bonus Nudge Range. The game also has Reel Bonus games that will definitely give you more chances to win! The Hold Feature in the HipHopopotamus online slot game occurs randomly and its function is to hold the position of 1 or more reels for the next spin. When the Hold Feature is active, you will see the “Hold” buttons displayed just beneath each of the 3 reels. 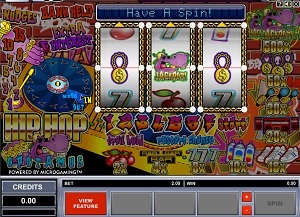 The Nudge Feature in the HipHopopotamus online slot game occurs randomly and its function is to allow you to bump a reel to display the next symbol. You can win up to 15 nudges per spin. The Nudge Bank Held Feature in the HipHopopotamus online slot game occurs randomly and its function is to bank your awarded reel nudges. You can win up to 15 reel nudges each spin. The amount of nudges rewarded to you is highlighted, and the Nudge buttons are enabled. The Extra Interest Feature in the HipHopopotamus online slot game occurs randomly and its function is you can win extra nudges. When the current amount of your nudges is banked, the Extra Interest will light up and flash randomly. Extra nudges will be added to your nudge total. The Shifta Feature in the HipHopopotamus online slot game is rewarded randomly after a spin that has no winning combination. Any normal win on the reels will activate the Scratches Feature. In this game, you can double your normal win amount. The wheel spins automatically and will stop on a random spot. If you land on In, your normal win is doubled and the wheel will spin again. If you land on Out, the game ends and you will only get your normal win. You can win up to a 500x multiplier on your bet amount as well as extra cool prizes in the Hi-Lo Bonus Feature game! To advance along the Bonus Number Trail Ladder, you will be collecting numbers given by random symbols on the reels. Thus, the more numbers you collect, the further you advance along the Bonus Number Trail ladder. When your collected sum is more than 7, the Hi-Lo Bonus Feature game is activated. The Hi-Lo Bonus Feature game is comprised of a Gamble Reel window and a Game Board. The Gamble Reel window shows numbers ranging from 1 to 12 with the Hi and Lo buttons. The Game Board is composed of 49 Game Squares, with each square containing a different bonus game. If you guessed the outcome correctly, you are randomly advanced either one step across, or one step up the game board. Every time you land on a bonus game, it is included to your pot. You can choose to Collect that feature, or you can go on playing to try to land on a more worthy feature. Simply click the Collect button to collect a bonus game. Please note that if you land on a Bonus square, that Bonus Feature is activated. When the Bonus Feature game is complete, you will be taken back to the Hi-Lo Bonus Feature game. The Hi-Lo Bonus game consists of 3 features: the Bonus Feature games, the Bonus Squares, and the Bonus Nudge Range. Bonus Nudges You can win up to 25 nudges in the Hi-Lo Bonus Feature game. Nudges collected in the Hi-Lo Bonus Feature game are allocated random cash values. If you collect your nudges, you are taken back to the reels wherein a win equivalent to your collected nudge cash value is nudged in. HipHopopotamus This is a stop-and-win feature. If you get this feature, the multiplier values on the game board will light up randomly. Click the Stop button. The multiplier is shown in the information window. The multiplier values on the game board will light up randomly for the second time. Click the Stop button. The first and second multiplier values are then summed up together, and the total is rewarded as a cash prize. Funk You Up This is a reel-based feature that guarantees a random win on the reels. If you activate this one, you will be taken back to the main game. Different regular symbols light up randomly in the information window. Click to Stop button to land on a symbol. The reels will spin automatically in the symbol combination you landed on. Your bet amount is then multiplied by the multiplier value you’ve won. Close 2 the Edge This is a Gamble reel-based feature. You gamble your nudges to win even more nudges. Rap It Up This is a stop-and-win feature. If you activate this one, 3 random prizes are shown in the information window. The prizes are concealed and shuffled. Click one of the highlighted Hold buttons to choose one that may have the highest prize, which will then be added to your total. Off Da Hook This is a reel-based feature. If you activate this one, you are taken back to the main game. A random number of winning combinations will be shown consecutively on the reels, wherein the total value of these wins will be rewarded to you. Busta Hippo This is a pick-a-win feature. If you activate this one, you are taken back to the main game. Different multiplier values light up randomly on the payout table trail. The Hold Buttons are active. Click a Hold button to choose a reel. A random multiplier value is assigned to that reel. The reels will automatically spin. If a Hippo symbol lands on the pay line of the reel you chose, you will win the assigned multiplier value. Your bet amount is then multiplied by the multiplier value you’ve won. Grand Master Cash This is a stop-and-win feature. If you activate this one, you are taken back to the main game. The payout table trail will begin to light up sequentially. Click on the Stop button to try getting to win the highest payout value. Multiplier Values You can possibly win up to 100x multiplier value on your bet amount. If you collected this bonus, you will be taken back to the main game and your total bet amount is going to be multiplied by the multiplier value you’ve just won. Rapper’s Delight This is a reel-based feature that guarantees a random win on the reels. If you activate this one, you are taken back to the main game. The reels will spin and randomly stop on a winning combination. Like a Jungle This is a reel-based feature. If you activate this one, you are taken back to the main game. The reels will spin. Click the Stop button to stop the reel in a winning combination, before the reels even stop on their own. Beats, Rhymes and Cash This is a stop-and-win feature. If you activate this one, you are taken back to the main game. The different symbol payouts will light up randomly in groups of 2. Click the Stop button to stop on a group of multiplier values. Your bet amount is going to be multiplied by the combined multiplier values. Win Spins Up to 15 Win Spins (or Free Spins) can be won in the bonus game. If you collect this bonus, you will be taken back to the main game and your Win Spins are automatically spun. *Bonus Squares – If you land on a Bonus Square in the Hi-Lo Bonus game, you will win extra bonus features that will flash randomly. Click the Stop button to get one of the bonus features. When the bonus feature is done, you will be taken back to the Hi-Lo Bonus Feature game. Extra Life The Extra Life bonus will allow you to continue playing the bonus game even if you incorrectly guessed the outcome of the next gamble. Change Number Adds a Change Number bonus to the bonus game, enabling you to change the number on the Gamble Reel window to show a different random number. Boost You are boosted up to a random yet more valuable position on the game board. No Lose This guarantees you a win on your next gamble, regardless of the number value shown in the Gamble Reel window. Shuffle This shuffles your position on the game board randomly. Optional. Restart Chance This gives you the chance to play the Hi-Lo bonus game after the bonus game ends. *Bonus Nudge Range – You can win up to 25 nudges! Nudges collected while playing the Hi-Lo Bonus Feature game are allocated random cash values. You cannot collect the Nudge Feature if it does not have a cash value equivalent. If you collect the nudges and it has a cash value, you will be taken back to the HipHopopotamus slot game reels wherein a win that is equal to the allocated cash value is nudged in. The range of Hi-Lo Bonus game nudges is: 25, 20, 15, 12, 10, 9, 8, 7, 6, 5, 4, 3, and 2. Random symbols seen in the HipHopopotamus slot game may contain Bonus labels. When a symbol with a Bonus label is shown on the pay line while playing the regular HipHopopotamus slot game, you will activate the Reel Bonus Feature game. Boost You are boosted up to a random location on the Bonus Number Trail. Selector Groups of Bonus Number Trail locations will light up and flash randomly. Click the Stop button to try to activate the Hi-Lo Bonus Feature game. Skillshot The Bonus Number Trail locations will light up in sequence. Click the Stop button to try to activate the Hi-Lo Bonus Feature game. Stoppa The Bonus Number Trail locations will light up. Click the Stop button to try to activate the Hi-Lo Bonus Feature game. HipHopopotamus has 3 reels where you may bet on 1 pay line. The minimum bet is 0.10 and the maximum bet is 10.00 per line. You can wager 1 coin only per pay line. Thus, the minimum bet amount is 0.10 and the maximum bet amount is 10.00 per spin. The maximum payout in the main HipHopopotamus online slot machine game is a 500x bet multiplier value. HipHopopotamus does not have an Autoplay function.